Being able to customize your makeup has become increasingly popular, especially among higher end brands. 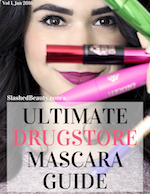 Hard Candy is the first brand that I’ve seen to try to take this idea on the drugstore scene with their new Glamoflauge Mix-In Pigment Makeup Drops. These makeup drops can be used to create custom coverage or color when mixing with foundation, moisturizer, or primer. 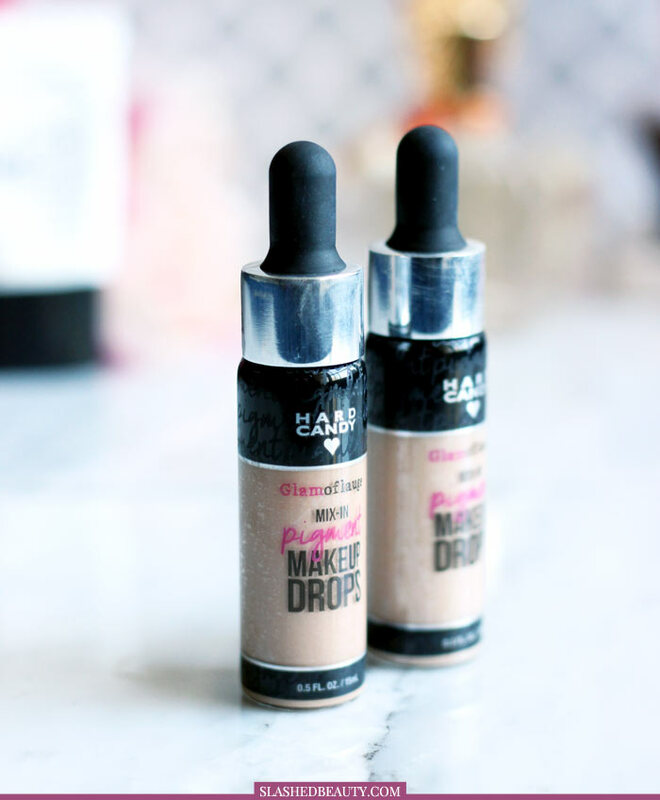 I’ve previously used shade-adjusting drops specifically to alter foundation shades when the color is a tad off, but there are so many more possibilities with these. Since they contain actual skin shades, you can mix your own face products depending on what you need. These pigment drops are super liquidy, and a little goes a long way when adding to other products. Because the formula is so thin, the dropper actually doesn’t really keep the product in the tube very well. It will start dripping as soon as you lift it out of the bottle, so work quickly. The more drops you add, the more coverage you get, or the more change you’ll see in an existing shade. 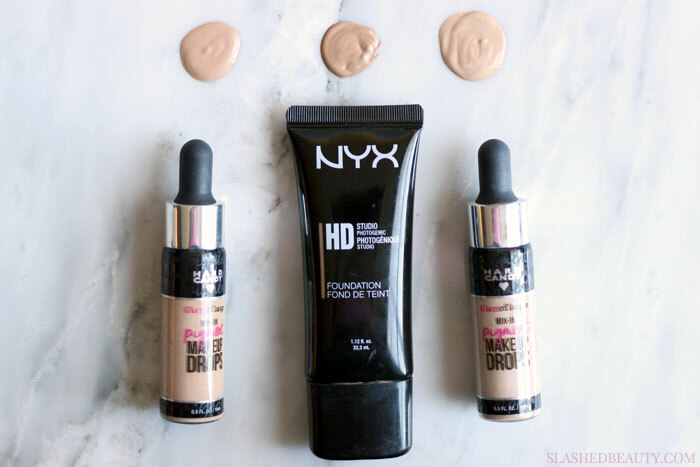 This NYX HD Foundation is one of my favorites, but I was way off when guessing my shade. In the middle, you can see the original shade. On the left is the foundation with 4 drops of Light 4 added, on the right is 4 drops of Light 3 added. You can see how it neutralizes the warmth as well as lightens it. The shade on the right is the closest match for me. One of my favorite ways to use these drops is adding them to primers or moisturizes to essentially create my own BB creams or foundations. 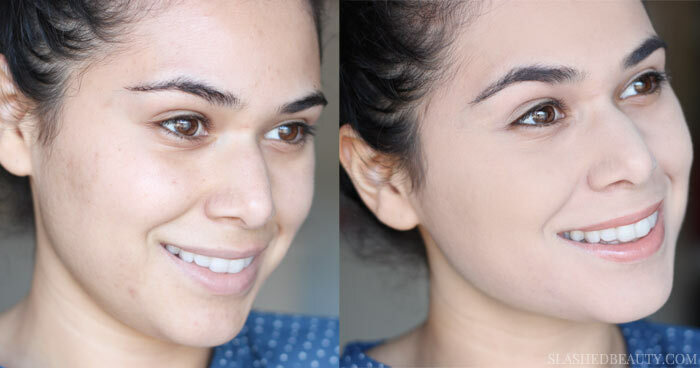 Mostly, I’ve been adding them to thick primers to create a mousse-like foundation for smooth and even coverage. On the left above, you will see my bare face. On the right is two layers of about 8 drops mixed into Smashbox’s Photo Finish Primer. 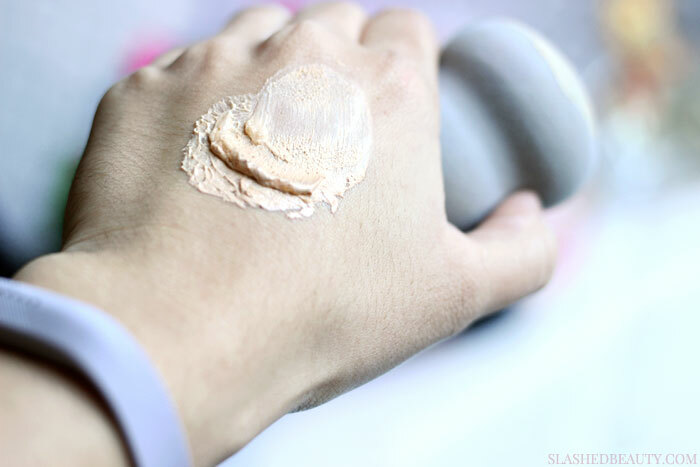 You can see that I get pretty decent coverage and I get a smooth, powder finish. I find the lasting power pretty average of a normal foundation when worn like this, where I don’t see fading until about 6 hours in. 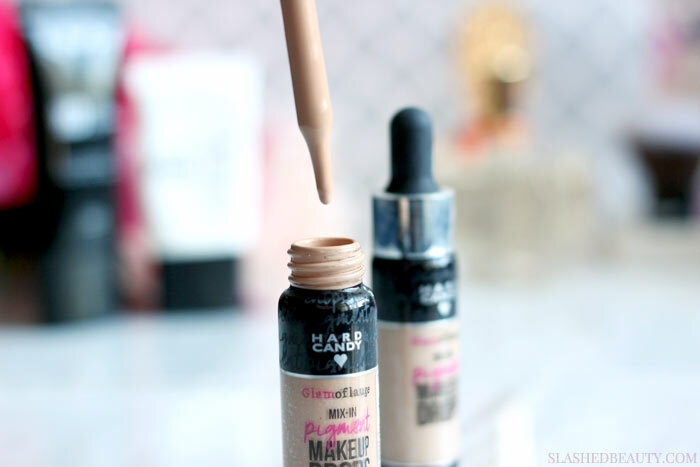 You can find the Hard Candy Glamoflauge Mix-In Pigment Makeup Drops for $7 each at Walmart. There are 12 different shades ranging from light to dark for all of your pigment needs! 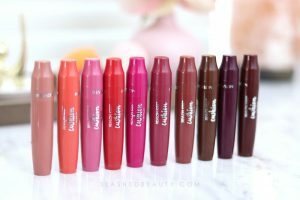 How would you use these pigment drops?